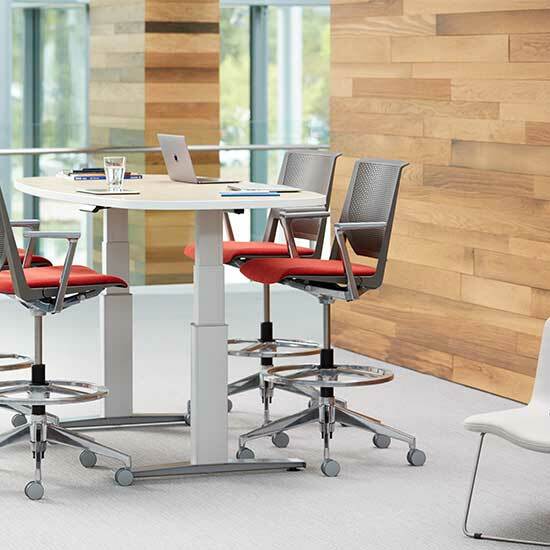 To create a more health-positive workplace, Haworth Jump height-adjustable tables empower you to choose the most comfortable way to work. You can vary your posture from sitting to standing throughout the day. 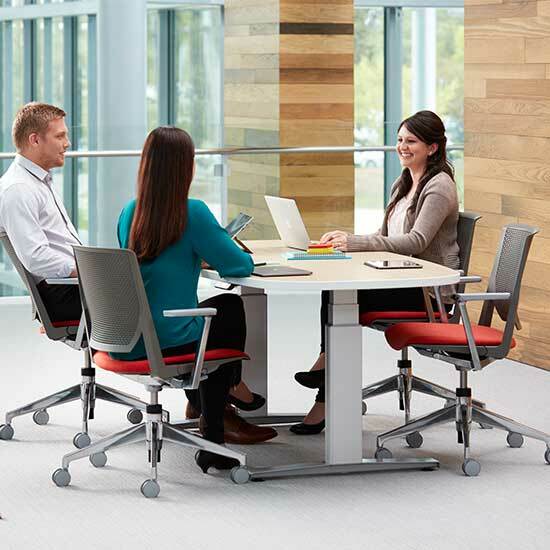 The broad line offers a range of table top shapes and sizes to support a variety of interactions or focused work. With no exposed screws, hardware, or motors, Jump has an elegant presence. The base is anodized aluminum for a premium finish. With the touch of a button, two powerful UL-approved motors raise the top at a brisk 1.5 inches per second. Dual columns are controlled by solid-state to ensure a gentle start and stop. The two base columns stay perfectly synced as they travel up and down. 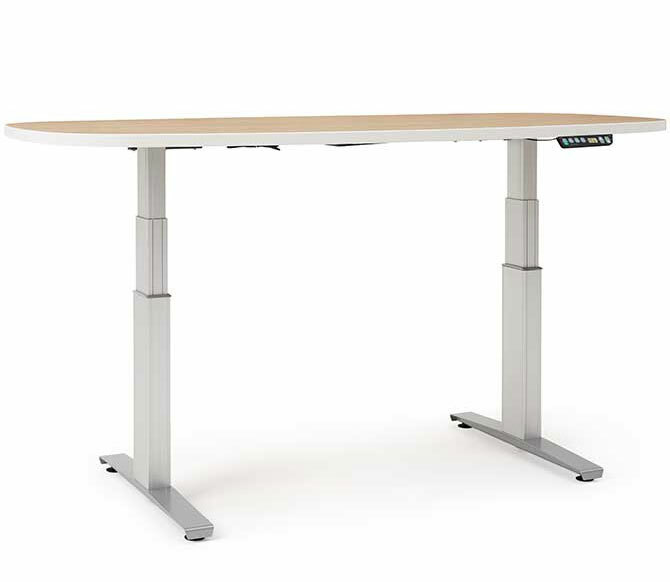 Jump supports up to 350 pounds, including the worksurface, and meets BIFMA standards. Height adjusts from 23.7 to 50.7 inches including top (dual stage). Jump’s premium anodized-aluminum frame will never corrode, flake, or peel. To support the top, the frame’s steel brackets attach with torque screws, providing strength and durability. Worksurfaces are available 34-82 inches long. On longer tables, a hidden crossbar is added for structural strength. Bases are Black or Silver anodized aluminum. 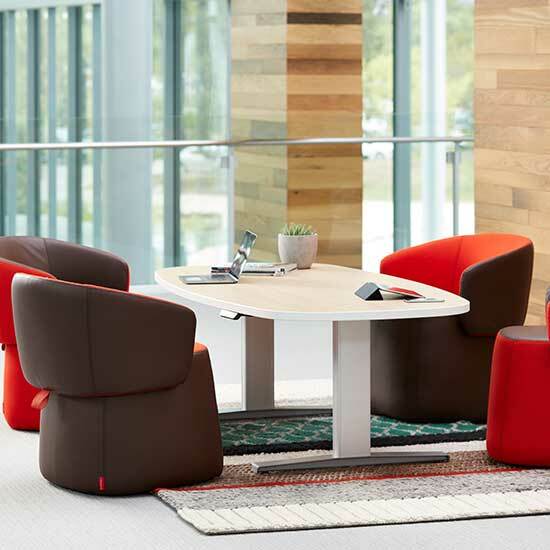 Jump is offered in standard Haworth finishes: laminates and veneers. Worksurfaces come in 10 shapes in a choice of edgeband and knife edges.